Primary Tradelines » Everything you need to know in one page! Primary tradelines have always meant one thing: an account on a credit report for which the primary account holder is listed as the primary account holder. 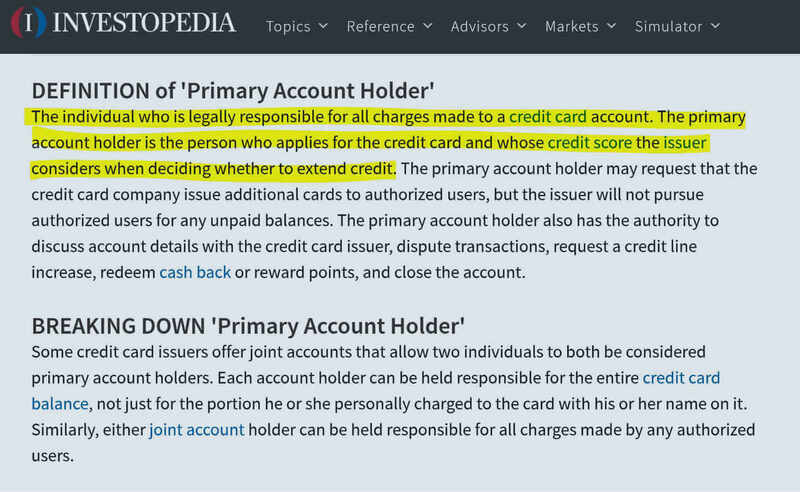 This is in contrast to piggybacking off of seasoned tradeline, where the account history reports on the authorized user’s credit report (as an authorized user… not a primary account holder). Sometime after the FICO ’08 myth, people thought that “primary” tradelines were “better” than authorized user tradelines. More importantly, they thought you could buy primary lines and add them to credit reports the same way as authorized user lines. Both thoughts are wrong. Where can I buy personal primary tradelines? Again, the real question is, “is it in your best interest to purchase primary tradelines?” You can get primary tradelines for free by applying to a bank that tends to give you a chance, like capital one and chase bank. There are too many scams out there concerning primary tradelines, so it is not even worth it to search out a legitimate source… the legitimate sources are usually buried beneath a sea of propaganda and shady businesses. Get primary tradelines from a bank, and boost your credit score with authorized user tradelines from us. Is it legal to buy primary tradelines? Unfortunately, we cannot give legal advice, and this answer should not be construed as to us giving legal advice, but there answer is “yes” and “no”. The way in which you obtain the primary tradelines is the determining factor of legality. Buying primary tradelines that were created out of the thin air could definitely be illegal, and there are companies out there that actually do this. However, assuming a pre-existing primary account or becoming a joint account holder and then removing the other account holder are technically legal ways to have primary tradelines. As stated above, there is no reason to jump through these hoops when you can simply get your own primary tradelines for free, legally. Can I purchase primary tradelines? The real question is, do you want to purchase or buy primary tradelines when you can get them for free? You can get some capital one credit cards and/or chase bank credit card with zero credit or even bad credit. Just get your primary lines for free (and don’t buy them), then boost your credit score with authorized user tradelines. Which is better, authorized user tradeline or primary tradeline? There is no cut and dry answer to this questions, so we will discuss both primary and authorized user tradelines. First of all, the question is more appropriately posed like this: “what do I need, authorized user tradelines or primary tradelines?” The first concept to acknowledge is whether you need primary tradelines or authorized user tradelines. Primary tradelines are beneficial to your credit score when you have a lack of them. If you don’t have any credit cards in your name, authorized user tradelines can only help so much. On the other hand, if you have a few credit cards that are young, have low limits, etc., tradelines for sale can help place a longer credit history on your report and decrease your debt to credit ratio. Again, it just depends what you need. Call us and we can discuss your specific credit situation. What does primary mean in primary tradelines? For all the confusion on the internet, the term primary tradeline is literal. It literally means a line of credit that is yours, primarily. This means it is not a joint account or an authorized user account. Every line of credit is a primary tradeline for the primary account holder. Auto loans, credit cards, mortgages, these are all lines of credit that are primary for the primary borrower. The authorized user or joint accounts exist when the primary holder of an account lists you as an authorized user or a joint account holder. Do seasoned primary tradelines exist? Yes, technically, seasoned primary tradelines exist. However, that is to say, a primary account holder with an account opened years ago, has a seasoned primary tradeline. If you are searching for seasoned primary tradelines, then you are most likely looking to add seasoned primary tradelines to your credit report to boost your score. 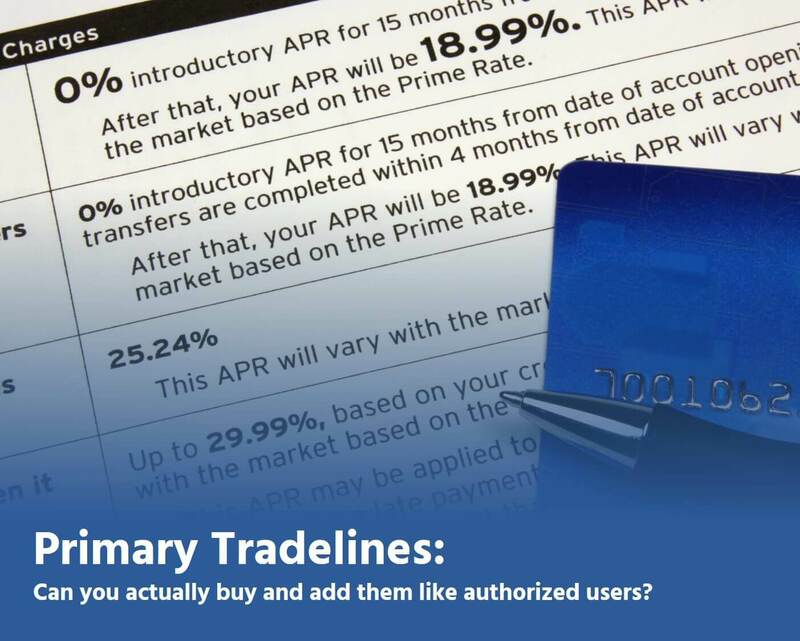 Adding primary tradelines is much more complicated than adding an authorized user tradeline. Stated gently, it is very difficult to sell primary tradelines… legally. Secondly, it is very hard to sell seasoned primary tradelines in a profitable way… so ask yourself why a company would or could exist considering these two limiting factors. There are legal ways to do it and to make money, so I am not suggesting that everyone out there selling primary tradelines is a scam artist, but it is very difficult and we cannot recommend a single source for this process (and we have looked into it). You are better off buying seasoned authorized user tradelines and save yourself the time and energy. At the end of the day, if you need a primary tradeline, just get your own for free, and boost your score with authorized user tradelines. It doesn’t really exist the way you might expect. There are some ways: 1) You can do secured credit cards, which isn’t the best idea because it doesn’t really have a large impact on your credit report (after all, if it is “secured,” you’re not showing risk… credit scores are a risk model). 2) There are some “catalogs” and other online stores, as “carecredit” type lines of credit, but those aren’t worth buying either. So, I’d respectfully suggest you should start with your ultimate goal first, rather than an assumption of what you need to achieve that goal. For example, what if you could achieve that goal without “purchasing” primary tradelines? You should give us a call at 800-431-4741 to discuss your goals and we will let you know (for free) what we think. Thanks! [removed] has Primary business trade lines that really helped my business get funded last year. …GOOD PEOPLE. Hey Ron, can you tell me all about it? For example, how much they cost, how they reported (with debt and balances), did it have an impact on your credit, what type of lines (revolved, installment, etc.)? Who has primary accounts and how much were they? I have a way to get you primaries. Mortgage as well. Reports up to 4 months afterwards paid as agreed for an extra fee. Tell us more, Ron. Suppose I have a client that can borrow $250,000.00 (based on their income) for their home purchase. That is, the mortgage broker sees that they can afford $1,200.00 each month after calculating their income and expenses. Let’s suppose further that you added them to your primary tradelines, the auto loan and the mortgage. Since it is primary, those tradelines will be included in their monthly expenses, by say $500.00 or $1,000.00. Now, assuming you may have increased their credit score, you have killed their purchasing power and their loan is denied. Also, how is the mortgage servicer going to allow you to add someone onto the debt? How is the auto loan holder going to add someone onto the debt? Ross may I please have contact number and email to discuss about the primaries. Al, first, I’ve never see primaries in 7 years of being in the industry. They just don’t exist. Second, suppose they did exist… if you added these lines to someone’s file, you’d strangle their credit reports with debt and kill their purchasing power, defeating the purpose. Can I get your contact number or email? Check this (primary tradelines) page for details, but you can always call us at 800-431-4741 to get details about primary tradelines. We do not offer them, but we know a lot about them. Unfortunately, we do not sell primary tradelines, but also, they don’t really exist (legally). If you’d like to discuss a broader range of credit solutions, call us at 800-431-4741. Thanks! Are you sure? Give us a call to discuss. There may be better options. How muck will this line cost me,? Give us a call to discuss pricing. Pricing depends on the tradeline purchased and the tradeline purchased depends on which tradeline you need. Which tradeline you need depends on your current credit report and score as well as your credit goal. Hey Cru, just curious… are you reaching out for those primary tradelines mentioned above? If so, what do you plan to do if you got them? Awesome, what is your website? Tell us all how your primary tradelines work. Tell us the process to clean Experian and TransUnion in 5 days. Al please give Kay a call or text at 651-308-9780 for more information on the primary. Call 800-431-4741 for the truth about “primary” tradelines. Thanks! Hello Al, I need your service of primary tradelines how can I make contact with you? Can you send me some info? What’s your contact info ? Im interested in these tradelines. Whats your contact info? Hello… I am interested in your Primaries. How may I contact you? Lisa, we do not do primaries and do not know of anyone that does primaries. What are you trying to achieve in terms of credit? You cannot buy “primary” tradelines, and you don’t want to; you’d be responsible for payment on those accounts and that liability would kill your future purchasing power. Also, it’s unknown whether your credit scores would be positively affected. With authorized user accounts, you are not responsible for the debt, therefore, it doesn’t hurt your purchasing power. And, when you work with a legitimate company you will get quality tradelines with low balances and high limits with perfect payment history for many years. Here’s everything you need to know: Primary tradelines for sale do not exist. If they did, they’d hurt you (click here to see my response to Leroy, below). Oscar, please read about primaries. You do not want primaries. First, they probably don’t exist. Second, to the extent they “exist,” they’re probably illegal (see here). Third, they’d kill your purchasing power (because you would be responsible for the balance, as a “primary” borrower). Should I continue? I am not telling you what to do or what not to do, but you should just focus on your goal and ask people what you can do to achieve that goal. Al!!! Do you still have primaries available? I am interested in primary auto trade line. I need to purchase primary’s for my clients. how much do you sell them for? and can you show me one that’s actually posted before? He can’t. No one can. Because primary tradelines do not exist (legally). Unfortunately, primary tradelines cannot be purchased. However, you can purchase authorized user tradelines which may help you obtain your own primary tradelines. Let us know if we can help! hey i need your help, how can i purchase primaries? Hey Christopher. I tried to check out that site and ran into 3 security alerts, without reaching the page. I don’t recommend anyone else click that link. However, I have seen the kinds of products you’re discussing. But, it’s not paying money (or “buying”) a primary tradeline. It’s paying a fee for a primary tradeline you would otherwise be approved for… for free. In addition, in the types of situations you’re describing, you’re typically not able to use that primary account on anything other than the products being sold by the person who charged you for that primary tradeline. When people talk about primary tradelines, they’re saying “Hey, instead of adding me as an authorized user, can you make it show up as a primary account.” This isn’t possible. They ask because they think primary accounts are “better” than authorized user accounts, when it comes to credit score increases. In some ways they are (because it’s your account), but in some ways they’re not (because a balance on a primary account cuts into your purchasing power). Hey Al can I have your contact info? Primary tradelines are free. You simply apply for them. Do you have primary tradelines? Hey Tamra, No one has primary trade lines which you can purchase. You can apply for and be approved for a trade line which, in doing so makes it a primary trade line. However, you cannot purchase a primary trade line. I could go into more detail, or you can trust me. If you have more specific questions about this, I’d be happy to answer. Hey Rick, I have yet to hear from anyone who made contact with Al. It is clear why. Also, you should see my comment about primary tradelines, by clicking here. Can you please email me diaguinee99@gmail.com the list of primary trade-line. primary–are they still for sale? Are still have these Primary Trade line if yes how the process work anf how to communicat with you? I’m your primaries cost for each one of them? Great, give us a call at 800-431-4741 and let’s see if we can do business together. Thanks! Erin, I am not going to personally attack your integrity on the basis that I disagree with you. I’d ask that you adhere to the same policy, especially since what I said above is correct, true and accurate. First, a secured credit card is not a credit enhancement technique. Sure, it could help someone go from NO credit file to A credit file, but that’s not an improvement, that’s a start. Secord, this isn’t opinion, it’s math. Credit scores are risk models. A “secured” credit card has zero risk. < --- it's secured by the amount you gave the bank; there is zero risk of you not paying them back, because you paid them back already (before you charged anything to the card). This does not make you any more credit worthy. The only caveat is that making payments over time can positively affect your credit score (even on a "secured" card). However, it isn't the application and approval for the secure card that made your score go up... it's your repayment behavior. Finally, if you’re say “I have seen someone get 3 points from a secured credit card, therefore, you’re wrong.” Then, I’d also disagree. When I am referring to improving credit, it is implied that we’re talking about to an economically significant extent, not fractional bits which result in no economic gain. I am saying that if you’re denied for a credit card, mortgage, car loan, etc., you’re not going to get approved by adding a secure credit card. Its doubtful your score will increase at all, but your approval chances are less likely to increase than your credit score. I just re-read your post and thought of something else. Catalog cards and secured cards can help in one sliver of credit modeling; diversification of credit. However, it’s not that simple. For example, if you open a $200.00 secured credit card looking for a boost, you might be upset when you see your score go down, not up. Sure, you positively affected your “diversification of credit” (which is a FICO consideration), but you also just placed yourself in a adolescent score card bracket (which are very complicated FICO considerations). So, secured cards have a purpose (starting credit files, diversifying credit, etc. ), but they don’t serve a purpose of increasing credit scores… especially not to an economically significant extent. In other words, your money would be better spent elsewhere. Hmmm, very interesting! Im definitely interested in repairing my credit but sure where to start. I’m thankful to see that secured credit cards are not the route to go because that was the direction I was headed. If anyone one could give me some insight, I would greatly appreciate it. We’re about to announce a relationship we’re in with a third party company for credit repair. For now, I will have Raj contact you. Look for an email from raj@superiortradelines.com Thanks! I just started a buesiness. I remodled a provete house to become commerical. I have zero tradelines. I dont know where to start. I do not want to pay for credit it is dishonest. Can u help. The only way to get credit is to pay for it. You open an account, charge to it, pay interest and the result is that you have credit. So, what’s the moral distinction between doing that quickly or slowly? That question is as hypothetical and philosophical as it is rhetorical. To answer your question, yes, we can help. We don’t “do tradelines,” we connect people with solutions. So, give us a call at 800-431-4741 because if we can’t help you, we know who can and will. Thanks! $15k limit 3 years history 2/4 payments remaining. You can add me to the primary and it shows up on my credit report as a primary Tradelines (or an authorized user)? That don’t exist, unfortunately. You can boost your score with authorized user tradelines and apply for your own primary line, though. What do you mean? Listen, if you have information that can benefit people, by all means, post it and I’ll publish it. Further, if it’s legitimate, I’ll send you leads. Don’t tell me I’m bad… tell me why you’re good. Don’t try to tear me down, let’s help build each other up. If you’ve got the goods, let’s go help people. Deal? Like everyone else on this site’s 939 comments and 75,000 words (more than 100 times any other tradeline website in the world), we do not “edit people information.” Except we might block out their private data if they left it in a public comment. TJ, we like helping people, so we take the information we’ve learned over the nearly 10 years of operations and over 32 years of combined experience in tradelines and relay our findings to people so they don’t make mistakes. In your case, you’re saying your single experience should be viewed as authoritative over our 10 years and 32 years of combined experience. I appreciate you wanting to help people, but I’d suggest you might be doing the opposite. While I appreciate hearing your experience, I would respectfully suggest that I’ve seen it all… all of it. There’s nothing you or anyone else is going to post that I have seen, heard of, thought of, had lawyers review, consult with people who procecute crimes, consult with lenders, etc. In stating this in passing, I’d respectully suggest that the following is not designed for my benefit, but yours and everyone else’s. 1) I agree with you that authorized user tradelines work, as we’ve written about in many places (such as here and produced a video here). 2) It is also true that lenders can disregard AUs, especially if you’re abusing the process and not doing it correctly. This concept applies to everything in the universe. Parachuting doesn’t work if you don’t pull the string. Icecream doesn’t work if you shove it in your ear 🙂 And so on. So, yes, it is important to do authorized user’s correctly, which includes working with a legitimate tradelines company like us, and avoiding people – as you point out – who are only looking for a sale. In fact, we turn down about 55% of leads that come to us. For example, people get CPNs (which are illegal) and stuff them with AUs and expect banks to lend them money. That’s not the authorized user’s failure, it’s the people who had a poor strategy by someone who didn’t care to advise them. I also wrote here with a reference to underwriting guidelines on when lenders consider or disregard authorized user tradelines. So, if someone says “100% aus work” or “100% aus do not work,” they’re both wrong. In your case, you’ve made very conclusory statements (“all the lenders I attempted to apply for said they disregard the au’s”) which may or may not be true, but 100% chance is NOT true in all situations. It very well could be the case that you worked with a bad company that said “Yeah, trust me, it will work” when they shouldn’t have and you’re directing your frustration at tradelines rather than bad advice from an inferior company. 3) As I’ve pointed on in this very comment section, secured cards are… well… secured. When you “secure” something, there’s no risk. A credit score is a risk model. What makes you think adding no risk will increase your risk model score? Secured cards are good for “checking the box” on having a primary account, especially if (and, in reality, only if) you can’t get approved for your own primary lines.